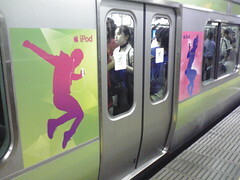 Looking back through the photos I have taken in Tokyo I found this one of a train covered in iPod advertisements. Not just the outside, but also all the ads inside. Being the major transportation form in Tokyo, about 70% of all travel, trains are also the perfect venue for advertising. There are ads around the inside of the car just below the roof; banners hang from the ceiling at intervals the length of the car; and JR East carriages have video ads above the doors (with all the dialogue in subtitles). But this train was special. All the ads are for iPods, all the poster, all the video, and it even had some on the outside. And not just this car, but every car of the train. I wonder how much it costs to have a train devoted solely to your advertising? And is it worth it? I have only seen a couple of devoted trains in my stay. But I can see when they might be effective: you have 5 to 30 minutes of a lot of people’s time, with only your ads to look at (aside from their keitai or PSP). This entry was posted in Mac, Photos, Travel and tagged advertising, iPod, Japan, photo, Tokyo, train. Bookmark the permalink.